NOTE: The thinking behind this model applies predominantly to enterprise SaaS operations. It also applies to the maturity of your customer success team, not the customer’s maturity in relation to their use of your product or their interactions with you. 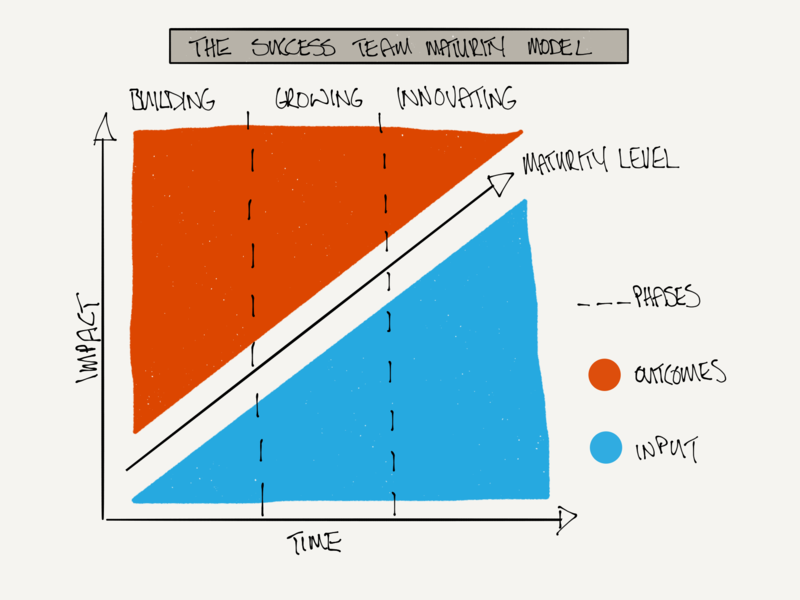 This long overdue post dives into the functioning of the maturity model. It’s not so much about the elements of each phase which are covered by separate chapters in detail. Becoming a successful customer success organisation takes time and you cannot become successful overnight. So the first premise to understand is that you need to level up through different phases of maturity. Then that input and outcomes are necessary at each phase. Finally, that the impact this has over time are central to the functioning of the maturity model. As mentioned in the note in the very first lines, this model applies to the customer success team, not the customer. 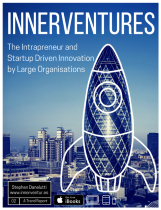 Mine is for those that want to build a customer success team as well as showcase best practice for organisations who have done it well. Having said that, of course impact on customers business has to be figured into the equation and you will see how I’ve done that. So onto a little around the main building blocks of the maturity model. The build, grow, innovate side of the phases should be pretty self evident and covered sufficiently in the first post I linked to so it’s really for input, outcomes, impact and time to be explained. 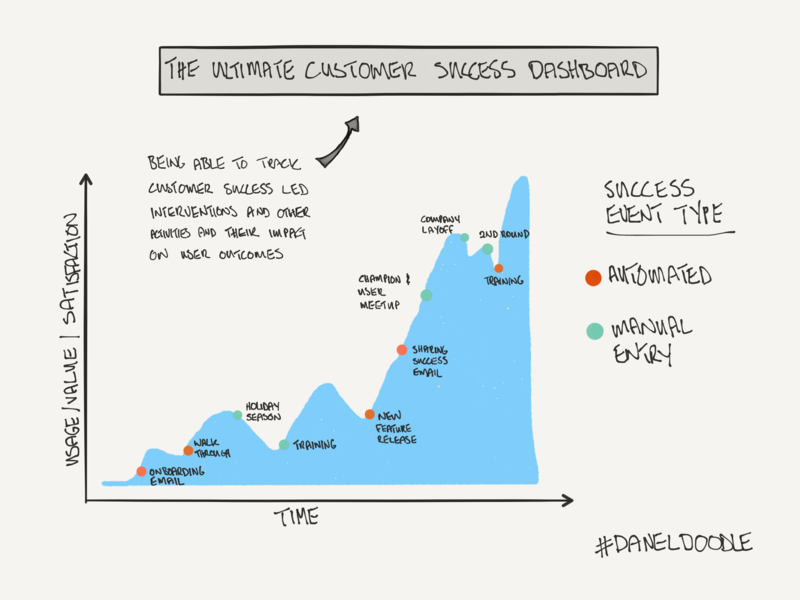 First a DanelDoodle to visualise things on the inputs and outcomes side. The context for this as I describe it is the science of customer success. The very necessary data driven side of things, something that I believe needs emphasis. Input should cover not just human activity but technological and automated activities. In other words, the causality between what you or the customer does and what outcome results from the action. Examples of input are shown in the diagram. Outcomes should as far as possible be quantifiable. That doesn’t mean to say you should only use telemetry to understand an outcome based on an input. You could use qualitative means, through a survey for instance, to gauge user sentiment. This would amplify understanding you would typically get from only looking at usage data for instance. Notwithstanding the way you measure an outcome, it is nothing unless you look at its impact. Seen in isolation, an outcome would just be a number or score, but without contextual analysis of what impact it is having, it might be meaningless. 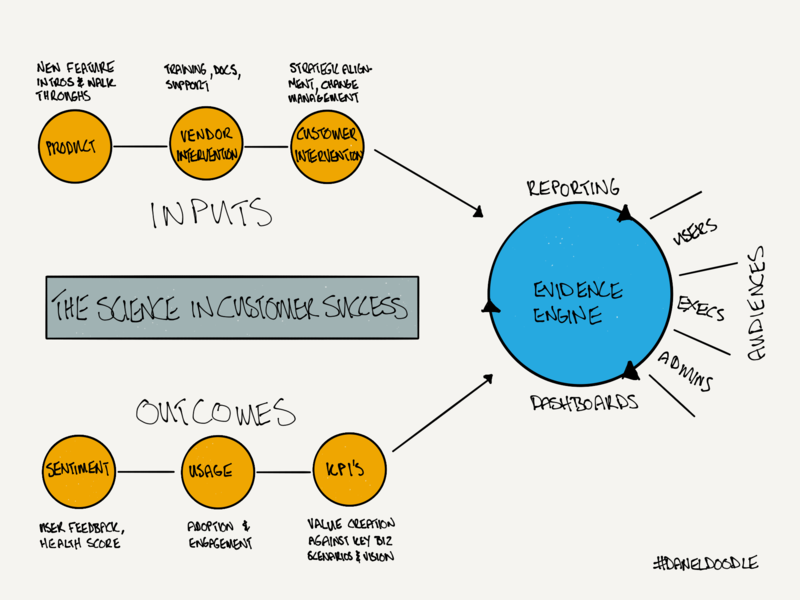 Examples of outcomes are captured in the diagram. By this I mean impact on the customers business. Material effects from actions with resulting outcomes. The emphasis which cannot be stressed enough, is impact on the customers business. This is kind of the last mile. In an enterprise SaaS business, while outcomes can be measured in terms of effects it has on users, impacts need to be measured in terms of how end customers are effected and how this impacts on your customer’s business. A simple example: A mailing with an explanation of a new feature increases usage of that feature by staff which results in an uptick of end user satisfaction. Time per se is not difficult to understand. What I want to stress is the likelihood that at the beginning of the journey you will not be in a position to be tracking the kinds of impact I’ve referred to above as you will later on. That’s because you will be too busy building systems (often internal operations) and may not even have the capability to track inputs, outcomes and impacts. The latter largely also depends on your customers involvement which will depend on the length of your relationship and their own maturity. I’ve often said that anytime I start out in a new role or advising starting out anew, my starting point would be this dashboard above left.